Citadel Investment Group ... announced today that its affiliate, Citadel Equity Fund, Ltd., has terminated the Rule 10b5-1 trading plan it entered into on August 11, 2009 in connection with its holdings of E*TRADE ... common stock. No sale of E*TRADE common stock had been made under the Plan, which was to commence on August 31, 2009. The Plan provided for the sale of up to 120,000,000 shares of E*TRADE common stock, representing slightly over 10% of Citadel’s holdings of E*TRADE common stock on an “if and as converted” basis. Citadel owns in excess of 1.1 billion shares of E*TRADE Common Stock on such basis, in addition to its existing debt holdings. Citadel was planning to sell some of it's E-trade holdings but ultimately decided not to. Why? Citadel and E*Trade struck a deal in June in which E-trade would route nearly all of its retail customers' Nasdaq stock and options trades to Citadel's market-making operation in return for a nice chunk of cash for E-trade - $100 million. Citadel obviously really wanted this deal and was going to pay for some of this by selling E-trade shares. Citadel also knew that as soon as the media gets a hold of that information, some E-trade retail investors will jump ship - giving Citadel more of an incentive to sell. That in fact happened, as E-trade lost 14,281 accounts on a net basis recently. But the Office of Thrift Supervision, who is (strangely enough) the regulator in this case, has surprised everyone by (at least for now) not giving Citadel and E-trade's the go-ahead to route nearly all orders (they are currently routing 40%). Citadel no longer needed to sell the depressed e-Trade shares - ergo the announcement. The transaction would be of great help to Citadel's market making operation because like any electronic exchange, it relies on order volume. But what concerns people is the link to the Citadel's proprietary high frequency trading that uses Citadel's market making platform (among others). 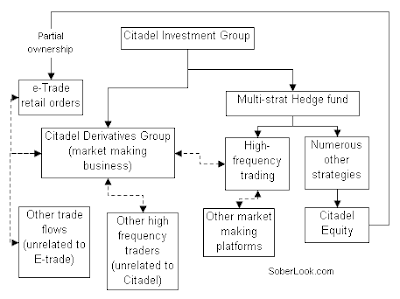 The high frequency trading desk (part of Citadel's multi-startegy hedge fund) places it's algorithms on the platform to electronically hit bids or lift offers on the platform's order flow (see "simplified" org chart below). The reality is that such an arrangement helps E-trade clients by providing additional liquidity and tightening bid/ask spreads. In terms of execution, it certainly beats what market makers do on NYSE. But even though none of this is improper, the potential for cozy relationships among the Citadel's entities makes people uncomfortable. And that is not so good for E-trade, particularly given the current anti-financial-services charged environment where conspiracy theories abound. They stand to lose many more retail accounts. A combination of TD Ameritrade and E-Trade could generate $500 million to $600 million in cost synergies, making a deal attractive, the analyst noted. A deal sometime in 2010 would make sense, but only if E-Trade's loan portfolio has significantly improved, or if TD Ameritrade can structure a deal that shields it from the bulk of the risks lurking on E-Trade's balance sheet, Vinciquerra said.